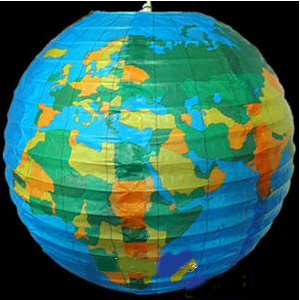 This 12 inch hanging Chinese paper lantern is actually a World Map lantern. This is a map of the world on a paper lantern! It has the whole world just waiting for you! You can hang this globe lantern from the ceiling with one of our electric cords if you like. You can also use this lantern as a centerpiece on the table of your next event with a little modification. Just add a battery operated LED light to it.